The entire political and media elite in Great Britain are today descending on Jeremy Corbyn (pictured above), the surprise frontrunner in the race to become the Labour Party’s next leader. I know there are good ideas in there, too, and that his lack of spin, his candour (sort of) and informality (etc) make a refreshing change from the timid incrementalism of the post-Blair Labour world. But running a party, let alone a government dealing with other governments, is a disciplined business. It’s got to hang together, which is not easy, as the Cameron government often shows…. Labour activists, the ones who do the hard work, are usually more leftwing than Labour voters, let alone floating voters. After 13 years of uneasy compromises in office, they want a leader who believes what they believe. If the price of the comfort blanket is permanent opposition, well, some would accept that too. Shame on them. There’s a lot of reason to believe that Labour’s top guns will pull out all the stops between now and September to prevent Corbyn’s once-improbable victory, from former prime minister Tony Blair and down through the ranks. Think about how Scottish independence so focused the energies of virtually the entire business and political class of Great Britain last September. If Corbyn still leads the pack by late August, you can imagine much fiercer attacks than anything Corbyn’s seen so far. Nevertheless, Corbyn is still on the rise. 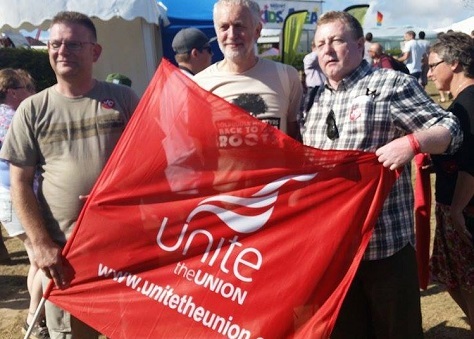 After winning the endorsement of Labour’s largest union, Unite, he nabbed the support of Unison earlier this week, and he won the support of the Communication Workers Union today. For good measure, the CWU, in its endorsement, added that Corbyn was the effective antidote to the ‘Blairite virus.’ Ouch. So what gives? If Ed Miliband, according to so many political professionals, lost the May 2015 general election because he veered too far left, how in the world (so the logic goes) will Corbyn manage by taking Labour far into the retreat of its 1980s thumb-sucking comfort zone? One perfectly rational response is that no one expects any of the disappointing crop of leadership contenders to last until the next election, which will almost certainly take place in May 2020. It’s a fair bet that Corbyn’s leadership, promising turmoil and division within the party, would not last five years. When Conservatives turned hard right in 2001 to Iain Duncan Smith, it took two years and two months for them to jettison him in favor of the more mainstream Michael Howard. Dan Jarvis, the shadow justice minister and decorated military veteran, springs to mind (though he’s backing Burnham in 2015). If you’re not enthusiastic about Corbyn’s long-term chances, but you’re neither enthusiastic about the other contenders (shadow health secretary Andy Burnham, shadow health secretary Yvette Cooper or Blairite newcomer Liz Kendall) and you don’t think any of these candidates will survive five years, what do you have to lose? After a year or two of Corbyn, the party could always turn to a more moderate figure if polls indicate Labour’s support is falling. The 2017 referendum on EU membership, like it or not, will become the natural pivot point of British politics in the five years ahead. By 2020, the Tories will have chosen a new leader — perhaps chancellor George Osborne, but also perhaps home secretary Theresa May, London mayor Boris Johnson or a newer face altogether like business secretary Sajid Javid. Corbyn himself will be 71 years old and after a full term as prime minister, Corbyn would be 76 — the oldest since Winston Churchill resigned at age 81 in 1955. First, it would fundamentally, once and for all, repudiate the Blairites — if Blair himself, Peter Mandelson, acting leader Harriet Harman and their next-generation acolytes like Kendall and Chuka Umunna cannot stop Corbyn’s leadership, it’s hard to believe they have much of a future directing Labour. By backing a successful Corbyn challenge, Labour’s unions and activists will demolish all but the most shameless Blairites. They’re out to put the nail in the coffin of New Labour, and a Corbyn victory, no matter what follows it, would amount to the death of New Labour. By the way, you need not be a socialist to share this sentiment — for a lot of reasons (the Iraq war, the attack on civil liberties, the incessant sniping between Blair and his then-chancellor Gordon Brown, the entire Brown premiership), it would be beneficial for the party to move on from the ‘New Labour’ branding. Second, it would pull the UK debate to the social democratic left — ground that the Liberal Democrats ceded when they entered government with the Conservatives in 2010 and that Labour ceded to the Scottish National Party (SNP), even under its former leader, the too-lefty-for-Blair Ed Miliband. A Corbyn victory wouldn’t just force Labour’s centrists to consider income inequality, the effects of chancellor George Osborne’s austerity budgets, the effects of increasing student fees, regional disparity, green policies, nationalization and so on. It would force all the major parties onto the political terrain of the hard left, Tories and Lib Dems (and Nigel Farage and UKIP) included. Third, it would be extremely effective in wooing back voters in Scotland, formerly a Labour stronghold. Unlike his middle-of-the-road opponents, Corbyn would force Scottish voters to give Labour a second look. It’s true that Ian Murray, Scotland’s sole remaining Labour MP, is backing Cooper in the leadership race. But on so many issues — health care, austerity, his symbolic opposition to Trident — Corbyn is pushing Scotland’s sweet spots. With the Scottish parliamentary elections coming in May 2016, Corbyn’s leadership would instantly change the dynamics of the race for Holyrood, giving SNP leader and Scottish first minister Nicola Sturgeon her first real challenge. Even if Corbyn doesn’t make it to 2020, a strong showing in the 2016 vote would give Labour the tools to start rebuilding its Scottish presence — and it’s hard to believe that Burnham, Cooper or Kendall could match Corbyn’s performance. If (and it’s a big if) a brief Corbyn interregnum manages to accomplish even one or two of those objectives, it might well be worth it to Labour unions and activists to take the risk. A year, let alone five, is a long time in politics, and the most rational case for backing Corbyn rests on the theory that his leadership would accomplish some key rebuilding goals that could leave his successor in an even better position to return to government in 2020.